Preheat the oven to 275F (140C). Line a baking sheet with parchment paper. Line a large plate with parchment paper.In a large bowl, stir together the almond meal, shredded coconut, salt, cinnamon, maple syrup, melted coconut butter, vanilla extract, and vanilla bean seeds until thoroughly combined. The dough will be thick and sticky.With a 2-tablespoon (30 mL) retractable cookie scoop, scoop a ball of dough and pack it in so the top is flat. Release the dough onto the prepared baking sheet. Repeat with the rest of the dough, setting the macaroons about 2 inches (5 cm) apart on the baking sheet. Bake for 15 minutes, then rotate the pan and bake for 10 to 15 minutes more, until the macaroons are a bit golden around the edges. Watch them closely during the last 5 to 10 minutes. Let cool on the baking sheet for 10 minutes, then carefully transfer to a cooling rack to cool completely.In the top of a double boiler, melt the chocolate and coconut oil together over low-medium heat, stirring frequently until smooth. (Alternatively, melt them together in a small pot over low heat, stirring frequently.) Turn off the heat.Dip the flat base of each cooled macaroon into the chocolate and twirl the macaroon until the base is coated in chocolate. As you dip them, place each macaroon onto the parchment paper-lined plate, upside down, so the chocolate coating is facing upward. Freeze the macaroons for 10 to 15 minutes, or until the chocolate has hardened.Flip each macaroon chocolate-side down and drizzle the remaining chocolate on top (reheat the chocolate until liquid, if necessary). 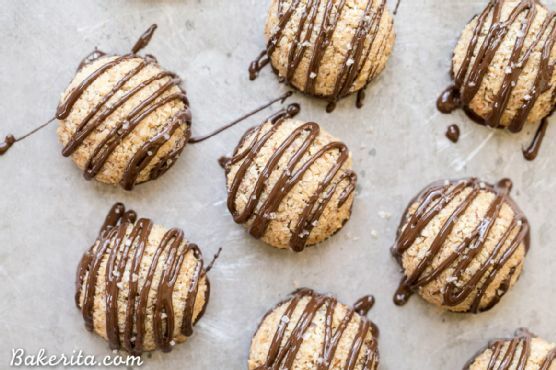 Freeze for 5 to 10 minutes, until the chocolate drizzle is firm.Store leftover macaroons in an airtight container in the fridge for up to 1 week. You can also wrap the macaroons in foil, place them in an airtight container or freezer-safe zip-top bag, and freeze for up to 1 month. Macaroons works really well with Cream Sherry, Moscato d'Asti, and Port. A common wine pairing rule is to make sure your wine is sweeter than your food. Delicate desserts go well with Moscato d'Asti, nutty desserts with cream sherry, and caramel or chocolate desserts pair well with port.